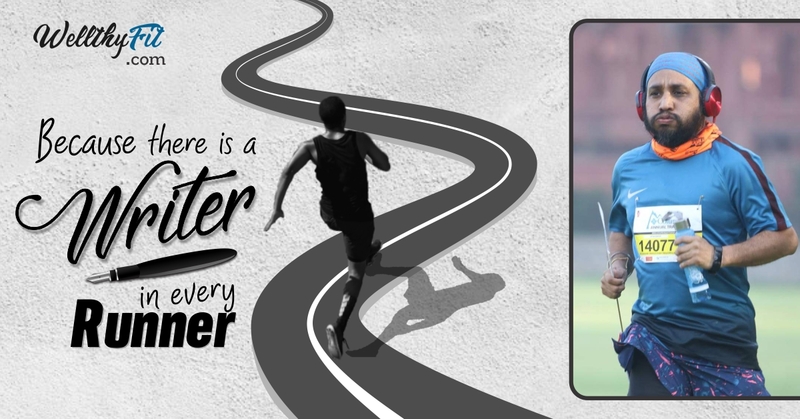 This week – the Runner-Writer on Wellthyfit is a 37 year old – Jitindeep Singh. He holds a Masters in Business Economics from Delhi University and works with a Chinese Based MNC in Delhi. He is passionate about photography, and covers events out of love for Team Super Sikh Run! Running Happened to him at the end of 2016 with his first attempt of 5 kms in 33 Minutes. The real change in his life happened when he met more and more people at running events and developed a deep liking for running and cycling. Since then he has been training consistently on both his running and cycling! He says ” This is start for me, I want to take it slow and steady and reach for my miles. I am yet to do a Half Marathon but I am in no hurry for the same. Sooner I would reach there too “! So the mind & plan was set, this was my 3rd run of the year. Was eager to be there & kill the run. Wanted to go to the sub 1 hr for my 10 kms run, I was sure I would be able to do so as the winter was almost over & the chill that have been in air was almost done, and with the run starting at 8AM makes it even more sure that with layers of cloths I wud be able to make sure I run the best run tomorrow. i rested well the day before the run, but a late night with the family the night before had already done its bit. Before I went to bed I had some bad feeling of the food I ate & also legs kind of got tired during the walks in mall & my kid making me go thru usual dad and son run ups during outings. But then, that is life! I did have an upset stomach that night and that took a toll on my sleep. But I was eager to go run, the excitement had already taken over me. And the run started. I started well, but very soon I was exhausted. I was aiming a new target, I had an upset stomach. I walked and ran and walked and ran. By the time I reached 5 km mark, it was almost more than 30 Minutes, and I was drained. I took another walk at 6.5 kilometer and now instead of thinking of completing my run in 1 hr I was sure that I would not be able to complete the run and that was totally heart breaking for me, I was not even at 7 Kms yet. At this point, I thought “bloody Hell” why am I even torturing myself. I wanted to walk away to my car at that moment and not think about how I woke up in the early hours of winter mornings to go run. I gave no thought to my corprorate job which does not let me rest through the day – so yes walking towards the car and quitting it all sounded like the best option. I didn’t look for the answer as to how it all started – why did I start changing my life, how did running happen to me – instead I looked straight into my running app. It was 45 Minute + and 7 kms !!! So my mind said – just 3 kms to go, forget all and just keep the pace steady, even if you do 8 minutes per kilometer from here you will be at finish line in 24 minutes. Even though that would have been the longest time I would have taken to finish my 10k and I actually came out this morning to do a 10k PB! Life! So I removed my head phones and just went on – didn’t think about the time and the pace. just wanted to see the finish line. I crossed the line @ 1 hour 04 Minutes – was it bad timing? NO – not at all. Those Last 3 kms have kept me going for a very long time now. Whether you run or cycle or swim or gym, we all have our reasons to be out there but then we all have 1000 more reasons to give up. But pushing through those last 3kms will push us for a long time to come. Think before you give up, think which is hard way but think which is your way. Giving up is easy but we have given up many things in life and then regretted. So why do we have to give up something which makes you smile or which makes you know more of your body, soul and health. You are one of the many people who have chosen to live a better life. You are one of the few people in the category of 1000s who strive to finish. Stay strong. Learn & be good.